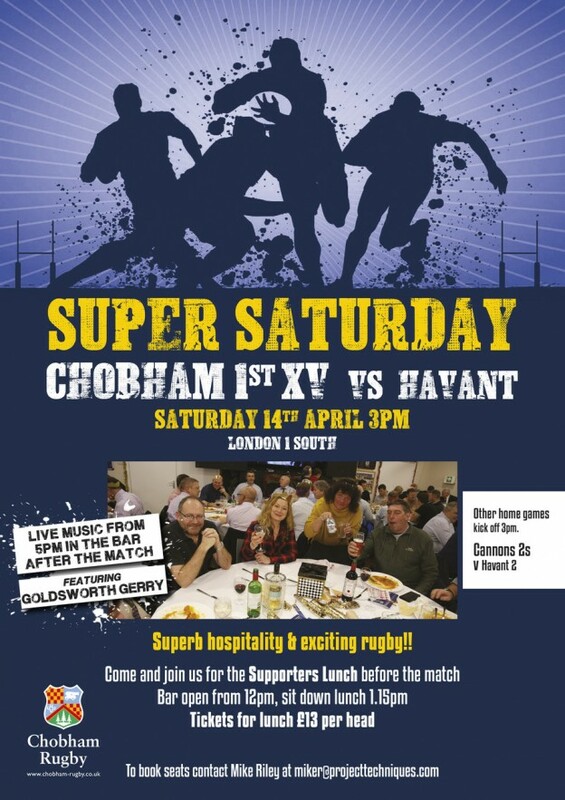 Super Saturday supporters’ lunch 14th April 2018 kick off 3 pm. Saturday 14th April 2018, is Super Saturday at Fowlers Wells and sees the final supporters’ lunch of the season, hosted by Mike Riley and myself. Not only will there be a culinary feast to enjoy but there will also be a feast of rugby to look forward to. The 1st XV play Havant whilst the Cannons play Havant 2s. Both matches will kick off at 3 pm. The cost of the lunch, is £13 and will comprise Chicken curry with accompaniments, followed by David’s mess and cheeseboard. There will also be Post-match entertainment in the form of a local band called ‘Goldsworth Gerry’. The supporter’s lunch is welcome to one and all. As I will be away please can you let Mike Riley know how many seats/tables you would like by e-mailing him here ? The closing date is Wednesday 11th April 2018.